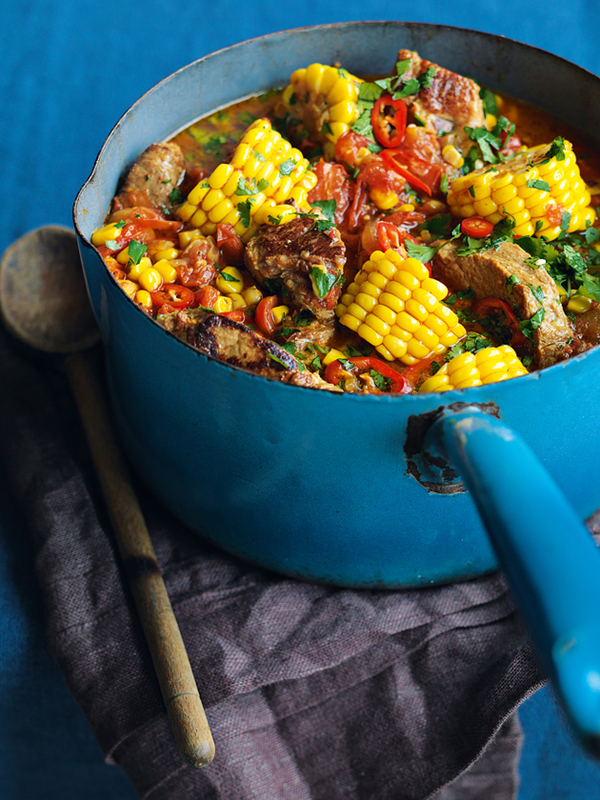 This pork stew recipe is the perfect feed-a-crowd summer dish! This one-pot pork stew recipe by chef Alan Rosenthal is an easy to dish to make for dinner and then take as leftovers for lunch the next day – as it will still taste great! Heat the oil in a wide saucepan that has a lid, then brown the pork in batches and set aside in a bowl. Add the onions to the pan with a splash of water and some more oil if it’s looking too dry. Cook gently for 10–15 minutes until very soft and starting to brown at the edges. Add the garlic, oregano and cumin and cook for a couple of minutes, then throw in the tomatoes and let them break down on a moderate heat for 5–10 minutes before returning the pork and any juices to the pan. Stir through a good few pinches of salt and some grinds of black pepper. Cover with the lid and cook gently for 1–1.⁄₂ hours until the pork is tender. Once the meat is tender, stir in the corn kernels and the cob pieces and cook, without the lid, for another 5–10 minutes until the corn is done. Taste for seasoning; if your tomatoes were quite acidic you may need to add a little sugar to balance this. Serve garnished with some chopped coriander and a few chilli slices.